Illuminated magnifiers are invaluable when working in poorly lit areas or when you simply need "a little more light". Lighted Microscopes are especially handy magnifiers because of their compact size, light weight, and high magnification. This economical lightweight magnifier has a surprisingly good quality optical acrylic lens. At 5X magnification, it has a large 1.1" (28mm) field of view. It requires two "AA" batteries (not included). 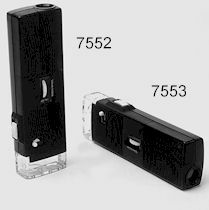 The price of the 7558 is $ 6.95. These microscopes feature an adjustable high-quality, precision light which can be aimed directly onto the object being viewed. They are excellent for use in many printing functions as well as hobby and other recreational activities. The 7552 has a .12" (3mm) field of view and 30X power. The price is $27.95. The 7553 has a .8" (2mm) field of view and 50X power. The price is $29.95.